Beer Rich McCain - A Budweiser President? 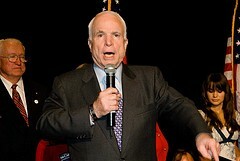 Beer sales earn presidential candidate John McCain a lot of money. Will he be, as some activists worry - a Budweiser president? The beer industry would like to see beer taxes halved and a lower drinking age; and they have lobbied hard against tough punitive measures for DUI offenders. McCain has significant beer industry ties - one of which shares a bedroom with the presidential candidate. McCain's wife Cindy (Cindy McCain) serves as chairwoman of the board for Hensley & Co, a major distributor for Amheuser-Busch; his son is the company's CFO and McCain himself worked with the company prior to earning his first congressional seat. Beer has been good to the McCains – their estimated net worth says 44 million dollars good, and alcohol control advocates are worried about a beer sponsored president signing off on critical public-health and alcohol control measures, or as George Hacker of the Center for Science in the Public Interest puts it, "It would not be helpful to have a president from Anheuser-Busch." McCain has consistently reclused himself from voting on alcohol related issues, citing a conflict of interest – an option unavailable to a sitting president. Activists report that beer industry groups in Washington have been lobbying hard for a repeal of the 18$ tax on a barrel of beer, seeking it halved to 9$, and have been pressuring Washington to remove sanctions on states that do not follow federal recommendations on drinking age and impaired driving blood alcohol percentages. Currently, states that do not follow these federal guidelines are not eligible to receive their full allotment of federal transportation funding. McCain has said that he supports keeping the drinking age at 21, although feels conflicted about letting young people enter into the armed services at 18, yet not allowing them the right to drink alcohol. Although McCain has no voting record on alcohol related issues, he has pursued tobacco companies aggressively, and worked hard to reduce the numbers of underage smokers. A once heavy drinker, McCain says that he now rarely drinks, and in his writings, described his father as a heavy drinker who changed for the worse after becoming intoxicated. The beer industry has supported McCain generously, granting him $152 000 in campaign contributions in 2008. Only two other candidates for federal office received more - the top benefactor was Hillary Clinton, with $210 000.